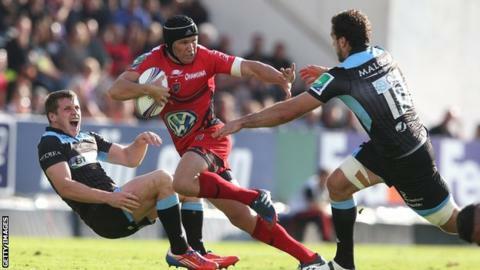 Defending champions Toulon swept Glasgow aside in the first half of their Heineken Cup opener but the Scots improved markedly in the second period. Maxime Mermoz twice crossed the line for home tries and Delon Armitage and Chris Masoe also rounded off moves as Toulon produced a stylish display. But DTH van der Merwe spearheaded a recovery that saw Gregor Townsend's men score four tries to earn a bonus point. Matt Giteau added two more Toulon tries to guarantee the hosts victory. Despite their ominous task, described by Townsend as "the ultimate test", Glasgow headed to the south of France in confident mood, their five consecutive victories taking them to the summit of the Pro12. Yet the Scots lost five of their six group games last term in Europe and they have not been involved in a knockout game since the 1997-98 season. Prior to this win, Toulon had 17 successive home victories in Europe and their first-half performance gave plenty of reminders as to how they had built such a record. Four times they breached the blue and black ranks and the gulf between the teams looked to be accurately reflected in the 34-0 half-time score. Jonny Wilkinson captained Toulon and with customary accuracy booted home three conversions and a penalty before leaving the pitch injured. The Englishman was adding the extras and putting the French out of reach in the match, but the real eye-catching rugby came from his team-mates, who moved the ball at pace and with accuracy. Fans of the Top 14 leaders roared their approval in the autumn sunshine. Niko Matawalu was correctly judged to have knocked the ball on before he burst through the Toulon defence and crossed the line in the very early stages of the game, and that was the last the travelling fans saw of Glasgow as an attacking force until the second half. Armitage set the tone as he rounded off a swift attack on the right and Wilkinson converted. Handling errors were almost absent as Toulon attacked repeatedly and Mermoz anticipated a pass by Josua Tuisova to make it try number two. If the first scores highlighted the French side's flair, their third was the result of raw power as they collected from the line-out, pushed the Glasgow pack into reverse and Masoe made the crucial incision. Frederic Michalak came on for Wilkinson, while Glasgow lost Alex Dunbar to a shoulder injury, with Byron McGuigan his replacement. The French half-back scored a late first-half penalty but before that was involved in Toulon's fourth try as he set up Mermoz, and the Australian Giteau took on the kicking duties to add the conversion. Whatever was said in the away changing room, Glasgow came out with real purpose for the second half. Van der Merwe caused some grumbling in the home stands when he scored Glasgow's first points with a purposeful charge over, but that looked like merely a minor irritation when Giteau's surge restored the 34-point advantage. However, a superb shimmy and run by Ruaridh Jackson provided the energetic Matawalu with the perfect chance to score Glasgow's second try and Jackson landed the conversion. And the Warriors were next to score when strong hold-up play by Ed Kalman was built on by the attacking Jonny Gray. Jeers and whistles filled the Toulon skies when Van der Merwe darted away from the home defence for Glasgow's fourth try and a bonus point. That was to be Glasgow's final scoring contribution, with a Michalak penalty and another Giteau try extending Toulon's winning margin. Toulon: D Armitage, Tuisova, Mermoz, Giteau, D Smith, Wilkinson, Claassens, Felsina, Orioli, Castrogiovanni, Botha, Williams, Fernandez Lobbe, van Niekerk, Masoe. Replacements: Michalak for Wilkinson (27), Mitchell for Claassens (44), Chiocci for Felsina (57), Hayman for Castrogiovanni (50), Rossouw for Botha (41), S Armitage for van Niekerk (60). Glasgow: Maitland, Seymour, Bennett, Dunbar, Matawalu, Jackson, Pyrgos, Grant, Hall, Welsh, Gray, Kellock, Swinson, Fusaro, Strauss. Replacements: McGuigan for Dunbar (32), van der Merwe for Pyrgos (41), Low for Grant (66), MacArthur for Hall (52), Kalman for Welsh (52), Vernon for Swinson (52), Weir for Strauss (75).